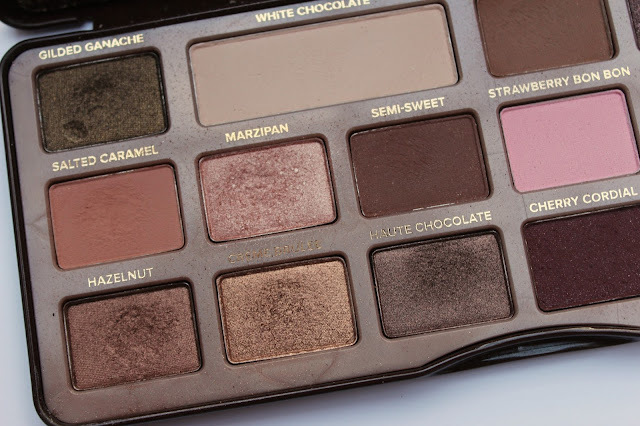 I'm conscious that I've recently done a fair few eyeshadow palette reviews but this is a post that is long overdue and I just couldn't hold off doing any longer. 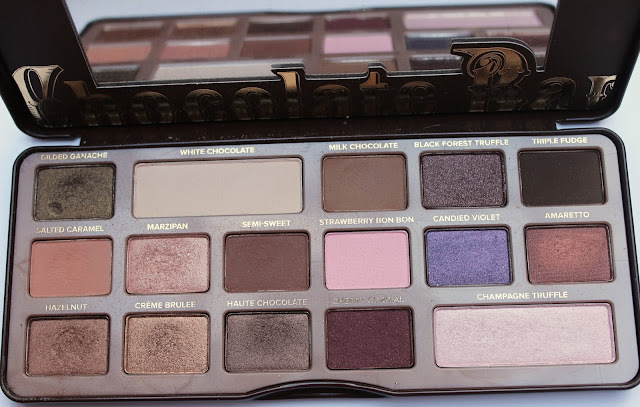 I purchased the Too Faced Chocolate Bar Palette on holiday in September on a bit of a whim. Don't get me wrong, I'd heard loads of good things about it but it wasn't something I intended on buying at all, however once I played with this thing in the shop it was in my basket pronto. Too Faced is a brand that I haven't explored too much but I have a couple of products which I love and has therefore resulted in a gazillion products being put on my wishlist. The shades in this really are stunning, plenty of neutrals for every day looks. I also love the few pops of colour thrown in, the pinks I pass on but the purples OMG. Admittedly I get the most use out of the neutrals but its nice to have options... there is nothing us women like more than an option. 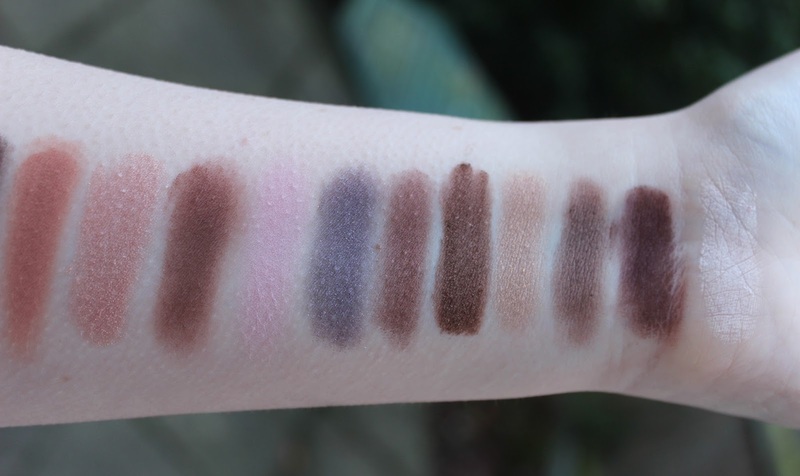 These shadows are just amazing quality, gorgeous, vibrant pigmentation and the way they blend? Without a doubt the easiest shadows to work with that I've tried. Typically, how do I use this palette? I take white chocolate as a brow bone highlight, the salted caramel shade to carve out a crease on my hooded eyes, milk chocolate and semi sweet in the crease and triple fudge in the outer corner of my eye. Then I'll pat something like Marzipan on the eyelid to create some space and lighten the lid. I also love the three bronze/ gold shades, Hazelnut, Creme Brûlée and Haute Chocolate and get a lot out of use out of them. Amaretto is a stand out shadow for me, its so unusual its a purple, brown shade that just looks perfect on brown eyes. Smokey eyes are a dream with this, you have everything you need for a brown, goldey, bronzey look. I do prime my eyelids with Mac's Paintpot in Painterly before I use these but thats just a normal step in my make up routine that I feel makes them last longer and really makes the colours pop. My only niggle is that I wish it had a bigger mirror but thats really not much of an issue. Other than that this is without a doubt my favourite palette and that is a big claim as I've tried a lot! 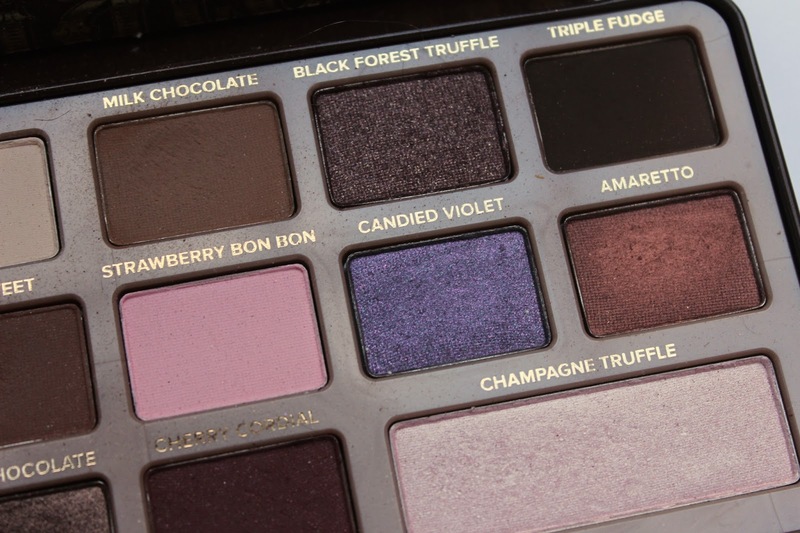 I'm hoping to get the Bon Bon palette in NYC so leave a comment down below if you would like a review on that one too.